To make the cake batter, cut the chocolate into fine pieces and place in a small bowl over hot water to melt, stirring occasionally. Set aside to cool. Beat the butter with 1/3 cup of the sugar until the mixture is soft and light. In a small bowl, combine the almonds, crumbs, and cinnamon and stir them together. In a clean, dry bowl with clean, dry beaters, beat the egg whites until they hold a very soft peak, then beat in the remaining 1/3 cup sugar in a slow stream. Continue to beat the whites until they hold a firm peak. Stir a quarter of the whites into the batter, then fold in the rest with a rubber spatula. Pour the batter into the prepared pan(s) and bake for about 40 minutes, until the cake is well risen and firm. Unmold the cakes onto a rack to cool. For the glaze, bring the currant jelly to a boil over medium heat. Lower the heat and simmer until the jelly is sticky and slightly thickened. Paint this glaze over the cooled cakes. To make the chocolate icing, combine the water, sugar, and corn syrup in a saucepan and bring to a oil over low heat, stirring to dissolve the sugar completely. While it cooks, cut the chocolate into fine pieces. Remove the pan from the heat, add the chocolate, and allow to stand for a minute. Whisk smooth. Position the cakes on a rack with a jelly-roll pan under them. Pour the icing over the cakes. Repair any uncovered areas with the icing that has dripped into the pan. Remove the cakes to platters before the icing has chance to harden or it will crack. 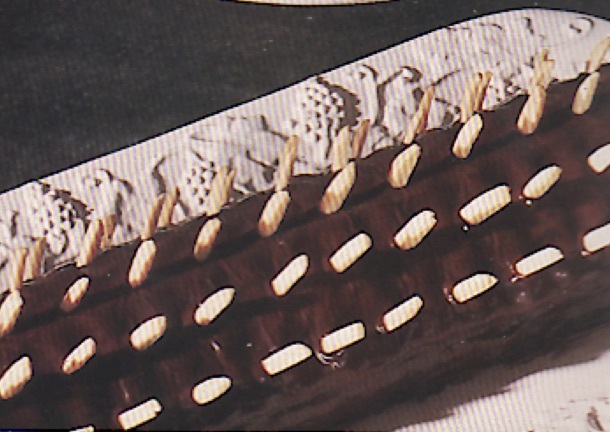 Insert the pieces of slivered almonds in rows, at an angle, down the length, all over the cake.